From Yellowstone we headed out through the West Yellowstone, MT entrance and headed northwest towards Ennis. We passed by Quake Lake, which Dwight and Scott had told me about. 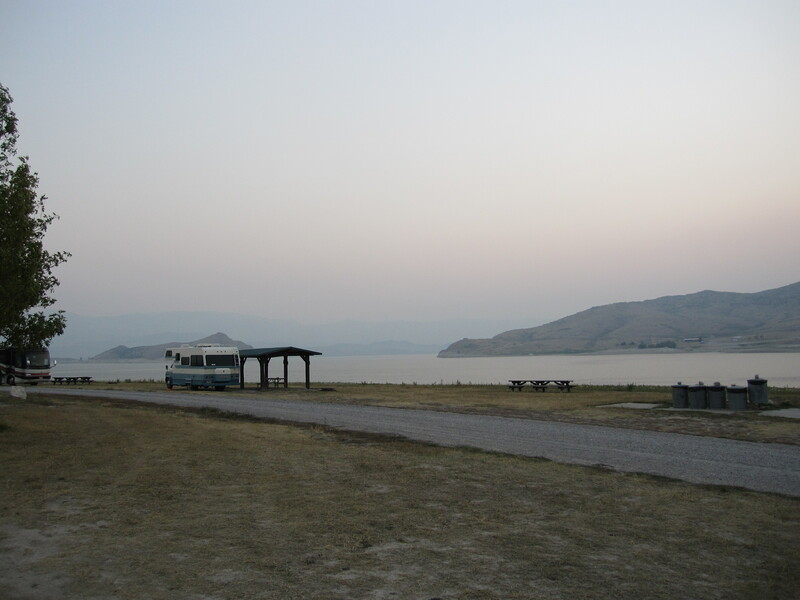 An earthquake in August 1959 caused part of the mountain to slide into the Madison River, covering the campground that was there and damming the river into a new lake. We kept on towards Ennis, a cute little town with an expensive grocery store, then east from Norris to a BLM (Bureau of Land Management) campground on the Madison River. There weren’t too many folks there, so we got a very nice site right on the river. I was tired of all the recent driving, so decided to stay for 3 days (Sept. 7-9) and just relax a bit. There were no hookups at the sites, but I had enough water and my new batteries were doing really well, so knew we would be good for at least 3 days. The river is pretty fast moving, and there were a lot of folks fishing and tubing. On the last night it was really windy. I almost thought I would have to move on to Bozeman in the middle of the night. The next morning there was a beautiful sunrise. So we headed out for Bozeman. I needed to do laundry, get a haircut, stop at Walmart and check out the town. It seemed like a neat town. It reminded me of Georgetown, TX, although about twice the size. The plan was to head west, stop in Whitehall for the night, down Hwy. 41 to Dillon to pick up I-15, and then to Clark Canyon Reservoir. The RV park in Whitehall was a dump, so headed to Butte. We stayed in a commercial campground (Monday, 9/10), then headed down I-15 the next morning. 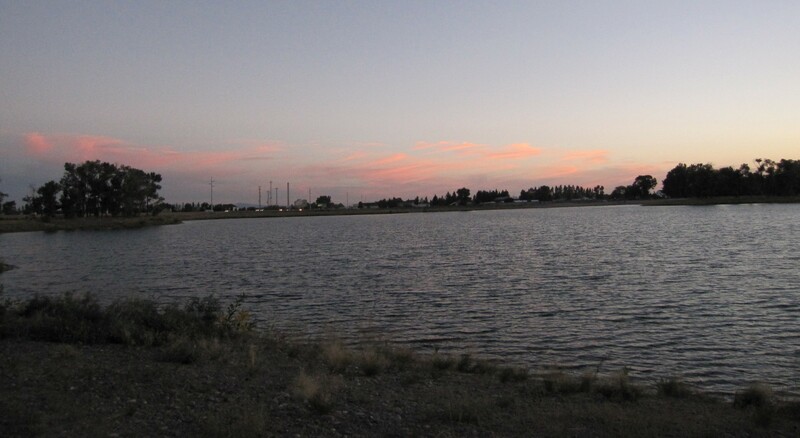 Clark Canyon Reservoir is a Bureau of Reclamation campground, and is free for up to 14 days. The lake is low due to drought, but still pretty. There was a pelican hanging around, but I never could get a good picture of him. We stayed 3 days, then headed down into Idaho. Stoddard Creek Campground is in the Targhee National Forest, but I couldn’t tell from the website if it was still open. When I got there it was near perfect. 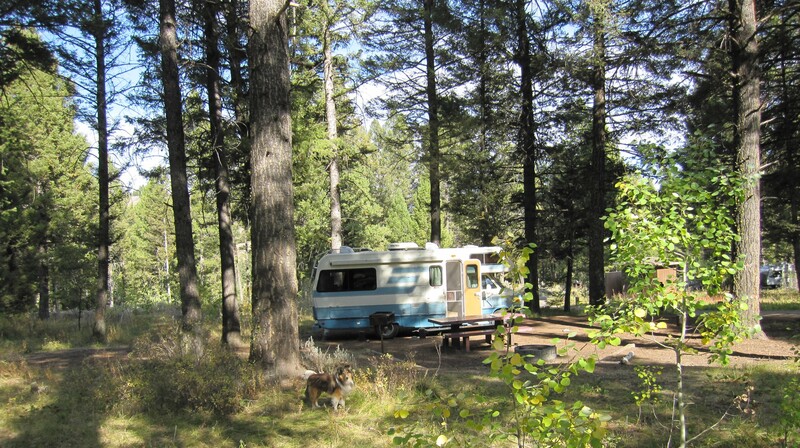 A beautiful forest campground only a mile or so off the highway down a well paved road. It was technically closed, but they hadn’t actually closed it down yet, so was free camping. We stayed one night, then on to Rigby. I had read that you could see the Tetons from the area, and they had a county campground on a lake with hookups. Unfortunately, smoke from fires to the north prevented any view more than a few miles, so could barely see a little bit of one of the Teton mountains. It was a decent park with a nice lake. OK for one night. The next day was Sunday, 9/16 and I wanted to stay at a commercial campground so I could watch the Nascar race, maybe watch some football and take care of the tanks. Found one in Idaho Falls that offered cable and headed over. After checking in I was unable to get cable. Turns out you have to get it connected by the cable company. More of a permanent resident feature. Oh well, I did get to catch some football. I decided I would try to do a commercial campground once a week on Sundays to have a “utility day”, then the rest of the week I would be good to stay wherever, off-grid.